Shirts With Random Triangles: Alabama officially honored for winning 2012 Iron Bowl. Alabama officially honored for winning 2012 Iron Bowl. 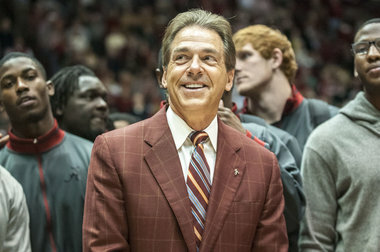 Alabama head football coach Nick Saban and the 2012 BCS Championship Crimson Tide football team did two things Tuesday night at the Auburn-Alabama men's basketball game in Coleman Coliseum. One was to officially be honored with the ODK Foy Sportsmanship Trophy for winning the Iron Bowl against Auburn last season. The other was to remind the Alabama men's basketball team, currently ranked 2nd in the SEC conference, who really the boss in Tuscaloosa.